Even just the thought of distance makes the heart grow fonder. Miles (Brandon Micheal Hall), Cara (Violett Beane), and Rakesh (Suraj Sharma) come face-to-face with Henry Chase (Derek Luke) in the God Friended Me Season 1 finale, but he's not behind the God Account. Instead, he, Simon Hayes (Adam Goldberg), and Pria (Parminder Nagra) are three more people the "God Squad" (as they call themselves) help. Cara may have lost out on a deal to turn her articles on the people they help into a book due to interference from her former editor, but she receives a better offer: to spend the next six months in Paris with Simon, Henry, and Pria and write a book about them rebuilding Simon's technology based on Henry's predictive analytics code. Miles encourages her to go, and Cara stops him from telling her he loves her during their goodbye. She knows she'd say it back and stay. After she leaves, a woman approaches Miles. She received a friend request from the God Account, which then sent her his name. TV Insider talked to Beane about Cara's move, Cara and Miles' relationship, the God Account, and the Season 1 finale. Cara's moving to Paris for six months. How does she feel about it professionally and personally when Simon first makes the offer and when she leaves? Violett Beane: Cara's in an interesting position that a lot of us find ourselves in when we just start dating someone and then something else happens in our life that might take us away from that. When Simon first offers the idea to her, she's [thinking], "Oh, no way, you're not for real. There's no way I can do that." But I think deep down, that's what she wants. Deep down, she wants to excel in her career, and she's always loved Paris. She knows that taking this offer would be a huge change for her and could be a really good thing. She's just worried that being away and changing the relationship that her and Miles have could ultimately be the end of it. But in the end, the two of them realize that if she were not to take the job and if she were to stay for him, then they wouldn't really have the relationship that they do have because their relationship is built on being there for each other and believing in each other. And if she stayed for him, then I don't think that they would really have the same relationship. Speaking of their relationship, they haven't had it easy. We see this move is already affecting their relationship because Cara wanted to take it slow and then they are saying goodbye and not saying the words they both feel. How do you think this affects where their relationship is going? I think that her leaving is going to be the ultimate test of if they can survive something like that and if they can, then they're going to come out stronger for it. And if they can't, maybe it was a good test in the beginning rather than going all the way down the road and then realizing. Do you think they would have shared that they feel those words they didn't want to say after a longer period of time? Maybe, yeah. I think they both feel it, and that's why they want to share it, but I think Cara stops Miles because of what she said, that she would say it back, so she needs to do this for herself, and when she returns, maybe things will be different. We only see this new character for a moment, but should fans be worried the God Account sent her Miles' way just as Cara's leaving for six months? It is pretty crazy timing. I'm actually really excited. The creators of our show won't tell us anything about what they're planning with that, but I am really excited as an actor in the show to see what their plan is for her. But it's a crazy cliffhanger, and when I first read it in the table read when we all got together, my mind was blown. I think that the fans are going to go crazy. Miles has decided that helping people is more important than who's behind the God Account. Do you think Cara completely agrees? For Cara, it's a little bit more double-sided. She wants to repay what Miles and the God Account were able to do for her and her own relationship with her mom, and so part of it definitely is that, but the journalist inside of her wants to get to the bottom of who's behind it, and she knows that the only way to do that is to continue helping people. What do you know about who's behind the God Account or what fans should keep in mind about it? I know nothing. I don't know who's behind it. I thought for sure that what Rakesh's character was thinking with the code and everything was totally accurate, so I was surprised by that as well, but ultimately, that question will be answered. I'm excited to hear what the fans might think about who's behind it. Do you have any new theories after the end of the season? I've always thought it would be interesting if it was Ali (Javicia Leslie) because she's always wanted to bring her brother and father together and help them see eye-to-eye and I think that that's one of the biggest things that's come out of the God Account, that they're able to have an open line of communication. 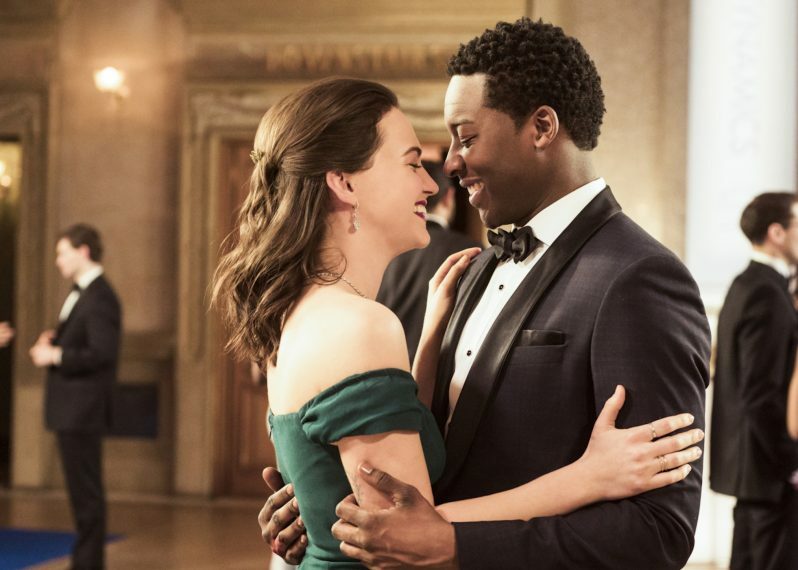 Should Miles, Cara, and Rakesh see Simon, Pria, and Henry as a cautionary tale for their future, especially with Cara's separation from the guys now? It's not necessarily as drastic, but they could grow apart because she's spending six months away and there's also this new character coming in. Yes, that's actually funny and awesome that you brought that up because I talked to Bryan [Wynbrandt], one of our creators, and he did mention that that is part of why they write those characters the way that they did. They wanted to show a parallel so that when the God Squad is figuring this stuff out about them and helping them mend their relationships that it shows in their own eyes and they can see themselves reflected in them and they can be more cautious to not let that happen. What are you hoping to have happen for Cara in Season 2? Is there anyone you'd like her to share more scenes with? I always love working with Rachel Bay Jones, who plays Cara's mom. She's fabulous, and I really just like hearing her perspective on life, so it would be really cool to work with her some more. But I hope for Cara just that she does grow in her career. She is a talented writer, and there's no denying that, so I hope to see something really skyrocket for her in Season 2. Do you want to see her get that book offer back? Yeah, or the offer that Simon gives to her in the finale. Maybe that story actually does take off. Are there any friend suggestions you want to revisit? One of my favorite episodes is "The Dragon Slayer" episode with the little boy and his father who were living on the street and in his car. I just found that story to be so compelling and the actors that played the father [Sharif Atkins] and the son [Jayden Marine] were so sweet. The kid was like a little Michael Jackson, I'm not even kidding, Jayden. They were just so amazing, and I thought their story was really heartbreaking and it would be cool to check back in with them and see how they're doing. Where do you think Cara would be professionally and personally without the God Account? Would she have reached out to her mother without it? Every friend suggestion that comes in, it sort of is painted as if, if the God Account didn't step in, would they have been okay? I think that's part of the wonder and mystery of the show and of the God Account. But I don't know if Cara would have ever spoken to her mom. I would like to think that someday she would work up the courage to do it, but maybe it would have taken a lot longer and maybe by that time, it would've been too long to form a relationship. I don't know. I think the God Account comes in at the right time for everyone. [She'd] probably still [be] at Catapult, probably not fired.